As hunters, fishermen, outdoorsmen we are inevitably attracted to place. We all have favorite hunting grounds, be it the mountains of Pennsylvania’s northern tier, a favored tract of State Game Lands or local corn field. Same with familiar hiking trails, birding areas or bass ponds. The Drifters (clockwise from left): Matt, Brad, Nick, Todd and Frank. I am drawn west. To the big skies and arid mountain ranges of southwest Montana. Don’t get me wrong, I love Pennsylvania and all that she has to offer. We have remarkable opportunities here – from border to border across the commonwealth – to satisfy every call of the wild. The Treasure State certainly fits that description. For the third consecutive year, I’ll be fortunate enough to spend the first week of July at Upper Canyon Outfitters in southwestern Montana, about 90 minutes from Ennis in the heart of the Ruby Valley. It’s a working fishing, hunting and horse-riding outfitter and ranch originally homesteaded over a century ago. The Ruby River flows 30 yards from our cabin. The nearest paved road is 12 miles away. I fell into this opportunity with a group of like-minded gentlemen who had been going to UCO for a few years prior to me joining in. We have since become great friends. We work separately in similar creative fields – a writer, a designer and a web guy, plus an outlier who is an athletic trainer by trade and a fishing guide by chance. This year, we have a first-timer making the trip. We fish hard all day and often into the evenings. Then retire to our cabin to narrate our many catches. And also the releases – some of which aren’t intentional. Each day brings a different stretch of water. 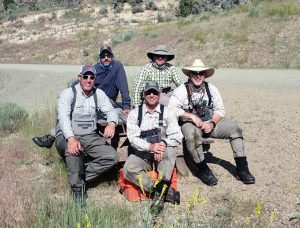 We’re not averse to doing a float trip on the Beaverhead River, blue-lining for five-inch cutthroat trout on spring creeks, prospecting for grayling or hitting a tailrace to mine for bruising 25-inch browns. We finesse delicate dry flies, we chuck burly streamers, and we nymph. We cover as much ground by vehicle and water by foot (or boat) as possible, sometimes well past dark. To sum it up: We drift.